The Easter Bunny has hopped on through town and it’s time to raid your kids’ Easter baskets for the good stuff. A few weeks ago, I had to stop and take note of Target’s Easter Peeps display. Last year’s was a little more impressive, but I couldn’t help but be drawn in by all the colors, perfectly coordinated. Each column its own little sovereign nation: white, pink, blue, green, purple. With Peep lollipops, Bunny and Chick Peeps, and Special Flavored Peeps. There were jelly beans last year, too. But this year? Cotton Candy! Hammond’s Cotton Candy, to be exact, in a variety of flavors. I grabbed some of the Vanilla, figuring it couldn’t hurt. The flecks of colored sugar sparkles begged me to turn it into a cocktail. That’s been on my mind since that Tropical Cotton-tini I had at T-Rex in Downtown Disney last year. And so, I finally did. 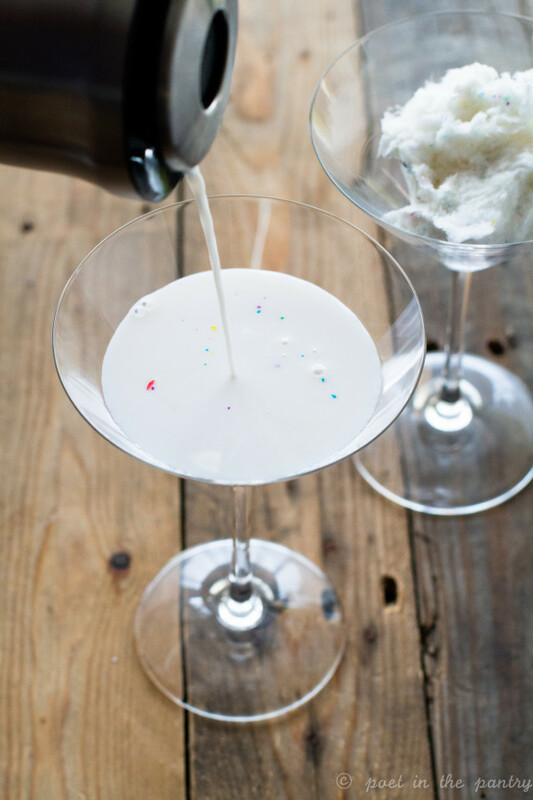 So…Marshmallow Martinis. I wanted something that evoked the idea of Peeps, without exactly replicating the flavor. Because, let’s be honest, they’re not that great. At least, not the original flavor varieties. Some of the special flavors aren’t bad, but I didn’t call for them because they’re not that easy to find… and I’m too cheap to buy a package of only 3 Peeps for $1.99. Marshmallow flavored vodka is the key here. You could probably swap out a lot of the other stuff to adjust the flavor, but you NEED it for the essence of this drink. I added a little raspberry liqueur and was pleasantly surprised. I highly recommend it! (Strawberry would probably be pretty great, too.) 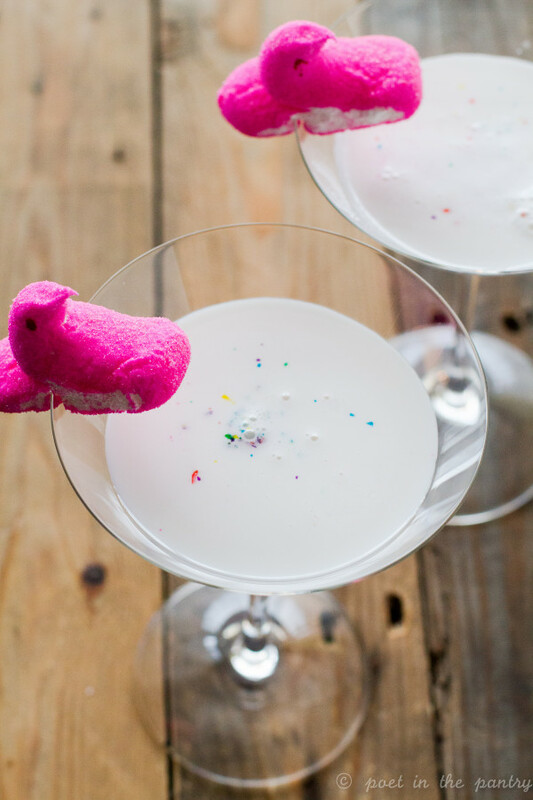 Throw a Peep on for garnish and you’ll be all set for getting through Easter Sunday’s full house of family (and kids hopped up on sugar). 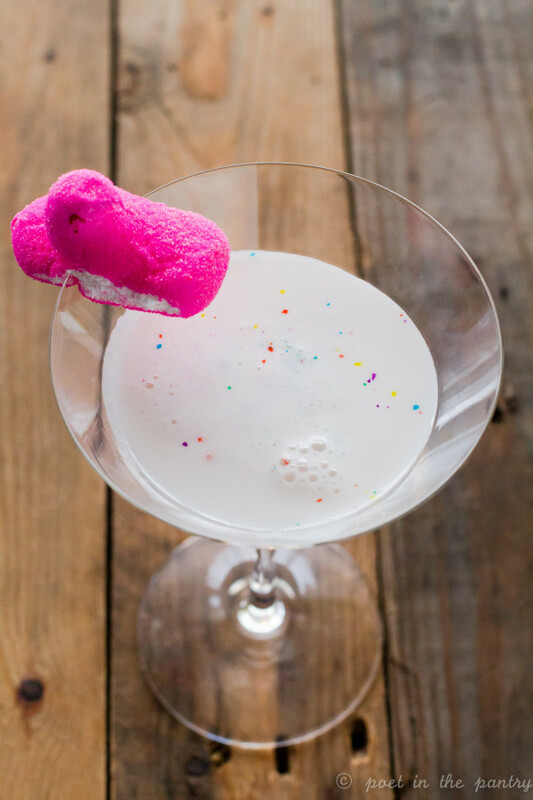 And by the time you finish your drink, you won’t even mind the taste of the Peep so much, either. Throw ice in a cocktail shaker and pour over it the marshmallow vodka, whipped cream vodka, raspberry liqueur, and half-and-half. Shake for 20 seconds. 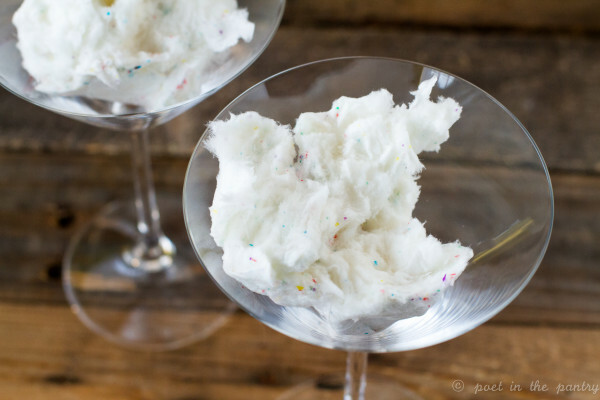 Split the cotton candy in half and place in 2 martini glasses. Pour over the cotton candy. Slice the bottoms of 2 Peeps and place on the glasses as garnish. Sounds delicious!! I would love it if you would link it up to Tipsy Tuesday at Grey is the New Black! Aw, man, I just saw this Pam! Let me check that out though! This is such a fun and smart cocktail! YUM! Thanks, Kristen! 🙂 Gotta do something with all that sugar, right?